1Facultad de Ingeniería. Universidad de Ciencias y Artes de Chiapas. Libramiento Norte Poniente 1150. Lajas Maciel, Tuxtla Gutiérrez, C.P. 29039, Chiapas, México. 2Departamento de Ingeniería Química y Bioquímica, Tecnológico Nacional de México-Instituto Tecnológico de Tuxtla Gutiérrez, Carretera Panamericana Km 1080, Tuxtla Gutiérrez, C.P. 29050, Chiapas, México. 3Centro de Investigación y Desarrollo Tecnológico en Energías Renovables, Universidad de Ciencias y Artes de Chiapas, Libramiento Norte Poniente 1150, Lajas Maciel, Tuxtla Gutiérrez, C.P. 29039, Chiapas, México. 4Catedrática CONACYT, Tecnológico Nacional de México-Instituto Tecnológico de Tuxtla Gutiérrez. Carretera Panamericana Km 1080, Tuxtla Gutiérrez, C.P. 29050, Chiapas, México. Untreated agro-industrial wastewaters are undesirable in the aquatic environment due to the presence of high organic matter contents. However, they may constitute a large potential for biogas production. The present investigation is focused on three laboratory-scale anaerobic expanded granular sludge bed (EGSB) bioreactors, continuously operated for 60 d under mesophilic condition with the aim of exploring the feasibility of treating three most significant agro-industrial wastewaters in Chiapas, Mexico (i.e., cheese whey, vinasse, and coffee-processing wastewater). The EGSB bioreactors were operated with a hydraulic retention time (HRT) of 6 d under stable conditions (i.e., buffer index (BI) of 0.31, 0.34, and 0.03), generating a maximum chemical oxygen demand (COD) removal efficiency of 91, 74, and 96% with an average methane production of 340, 245, and 300 mL/g COD∙d for cheese whey, vinasse, and coffee-processing wastewater, respectively. According to the obtained results, the EGSB bioreactors could be a sustainable alternative to simultaneously solve the environmental problems and to produce bioenergy. Anaerobic EGSB bioreactors were successfully performed for treating different agro-industrial wastewaters. 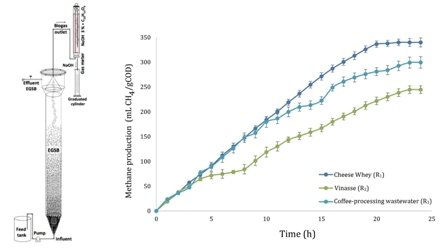 COD removal of upto 91, 74, and 96% for cheese whey, vinasse, and coffee-processing wastewater, respectively. CH4 yield of 340, 245, and 300 mL/gCOD∙d for cheese whey, vinasse, and coffee-processing wastewater, respectively. Biogas generated contained 63.5, 70.8, and 80.3% CH4 for cheese whey, vinasse, and coffee-processing wastewater, respectively. Abdalla, K.Z., Hammam, G., 2014. Correlation between biochemical oxygen demand and chemical oxygen demand for various wastewater treatment plants in Egypt to obtain the biodegradability indices. Int. J. Sci. Basic Appl. Res(IJSBR)13(1), 42-48. Adams, M.R., Dougan, J., 1987. Coffee Technology, John Wiley and Sons. New York. Aguirre, P., 2004. Removal mechanisms of organic matter and nutrients in subsurface flow constructed wetlands. New criteria for the design and operation of constructed wetlands. CPET. Barcelona. 17-29. Federation, W.E., American Public Health Association, 2005. Standard Methods for the Examination of Water and Wastewater, 20th ed. American Public Health Association (APHA), Washington, DC, USA. Björnsson, L., Murto, M., Jantsch, T.G., Mattiasson, B., 2001. Evaluation of new methods for the monitoring of alkalinity, dissolved hydrogen and the microbial community in anaerobic digestion. Water Res. 35(12), 2833-2840. Cruz-Salomón, A., Meza-Gordillo, R., Rosales-Quintero, A., Ventura-Canseco, C., Lagunas-Rivera, S., Carrasco-Cervantes, J., 2017. Biogas production from a native beverage vinasse using a modified UASB biorreactor. Fuel. 198, 170-174. Dareioti, M.A., Dokianakis, S.N., Stamatelatou, K., Zafiri, C., Kornaros, M., 2009. Biogas production from anaerobic co-digestion of agroindustrial wastewaters under mesophilic conditions in a two-stage process. Desalination. 248(1-3), 891-906. De Matos, T.A., Lo Monaco, P.A., Pinto, A.B., Fia, R., Fukunaga, D.C., 2001. Pollutant potential of wastewater of the coffee fruits processing. Federal University of Viçosa, Department of Agricultural Engineering, Viçosa-MG, Brazil. Gutiérrez, J.R., Encina, P.G., Fdz-Polanco, F., 1991. Anaerobic treatment of cheese-production wastewater using UASB reactor. Bioresour. Technol. 37(3), 271-276. Haddis, A., Devi, R., 2008. Effect of effluent generated from coffee processing plant on the water bodies and human health in its vicinity. J. Hazard. Mater. 152(1), 259-262. Janczukowicz, W., Zieliński, M., Dębowski, M., 2008. Biodegradability evaluation of dairy effluents originated in selected sections of dairy production. Bioresour. Technol. 99(10), 4199-4205. Londoño, Y.A., Peñuela, G.A., 2015. Anaerobic biological treatment of methylparaben in an expanded granular sludge bed (EGSB). Water Sci. Technol. 71(11), 1604-1610. Mao, C., Feng, Y., Wang, X., Ren, G., 2015. Review on research achievements of biogas from anaerobic digestion. Renew. Sust. Energy Rev. 45, 540-555. Martin-Gonzalez, L., Font, X., Vicent, T., 2013. Alkalinity ratios to identify process imbalances in anaerobic digesters treating source-sorted organic fraction of municipal wastes. Biochem. Eng. J. 76, 1-5. MoEF; Ministry of Environment and Forest, 2003. Water (Prevention and Control of Pollution) Cess (Amendment) Act, 2003. Ministry of Environment and Forests, Government of India, New Delhi. Pérez, A., Torres, P., 2008. Alkalinity indices for control of anaerobic treatment of readily acidifiable wastewaters. Ing. Compet. 10(2), 41-45. Prazeres, A.R., Carvalho, F., Rivas, J., 2012. Cheese whey management: a review. J. Environ. Manage. 110, 48-68. Qinglin, X., Yanhong, L., Shaoyuan, B., Hongda, J., 2012. Effects of ORP, recycling rate, and HRT on simultaneous sulfate reduction and sulfur production in expanded granular sludge bed (EGSB) reactors under micro-aerobic conditions for treating molasses distillery wastewater. Water Sci.Technol. 66(6), 1253-1262. Robles-González, V., 2011. Integrated treatment of mezcal vinasses for depuration and discharge. Doctoral Thesis. ENCB del IPN. México D.F., México. Robles-González, V., Galíndez-Mayer, J., Rinderknecht-Seijas, N., Poggi-Varaldo, H.M., 2012. Treatment of mezcal vinasses: a review. J. Biotechnol. 157(4), 524-546. Rodgers, M., Zhan, X.M., Dolan, B., 2004. Mixing characteristics and whey wastewater treatment of a novel moving anaerobic biofilm reactor. J. Environ. Sci. Health, Part A. 39(8), 2183-2193. Rojas, O., 2004. La alcalinidad como parámetro de control de los ácidos grasos volátiles en digestores UASB. 101-105. Shin, S.G., Han, G., Lim, J., Lee, C., Hwang, S., 2010. A comprehensive microbial insight into two-stage anaerobic digestion of food waste-recycling wastewater. Water Res. 44(17), 4838-4849. Sitorus, B., Sukandar, Panjaitan, S.D., 2013. Biogas recovery from anaerobic digestion process of mixed fruit-vegetable wastes. Energy Procedia. 32, 176-182. Speece, R.E. (1996). Anaerobic Biotechnology for Industrial Waste-waters. Archae Press, USA. EPA, 2003. CAFO regulations, Federal Register 68(29). Von Enden, J.C., 2002. Best practices at wet processing pay financial benefits to farmers and processors. GTZ-PPP Project on Improvement of coffee quality and sustainability of coffee production in Vietnam. Walkley, A., Black, I., 2006. An examination of the Degtjareff method for determining organic carbon in soils: effect of variations in digestion conditions and of inorganic soil constituents. Soil Sci. 63, 251-263.
 WHO, 1995. Guideline for discharge of industrial effluent characteristics. WHO, Geneva. 3, 231-236. Yen, H.W., Brune, D.E., 2007. 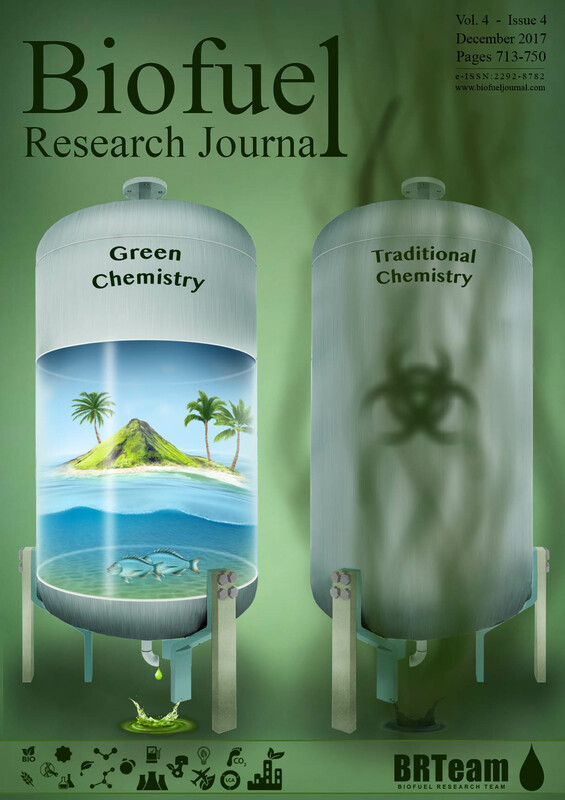 Anaerobic co-digestion of algal sludge and waste paper to produce methane. Bioresour. Technol. 98(1), 130-134. Zhang, R., El-Mashad, H.M., Hartman, K., Wang, F., Liu, G., Choate, C., Gamble, P., 2007. Characterization of food waste as feedstock for anaerobic digestion. Bioresour. Technol. 98(4), 929-935.